I Clinical researches are performed by physicians of Medical Academy in accordance with the Plan. 1 Select twenty children without corporal defect of musculoskeletal system and without cramp symptoms. Prepare four children groups for testing. Organizational work with the parents of observed children. Time period of preparation is two months. Method ENG and EMG completes one another more over it joints the visual analyzer with the neuromotor activity hands’ fingers, plus the regime of fatigue of these moments is determined. Method EEG allows to make up the comparative diagrams of dynamics of running neurophysiological processes more over the regime of fatigue of synapse structures and cells - neurons of cortex is determined on the level of the higher nervous activity. Period of check testing is two months. Scientific substantiation on physiological influence of the number system teaching to a child’s psychoemotional status. Recommendation by commission of experts on introduction of advanced technology into the program of state education. Time period from the moment of preparation and to the moment of Publication of sci. article is six months. 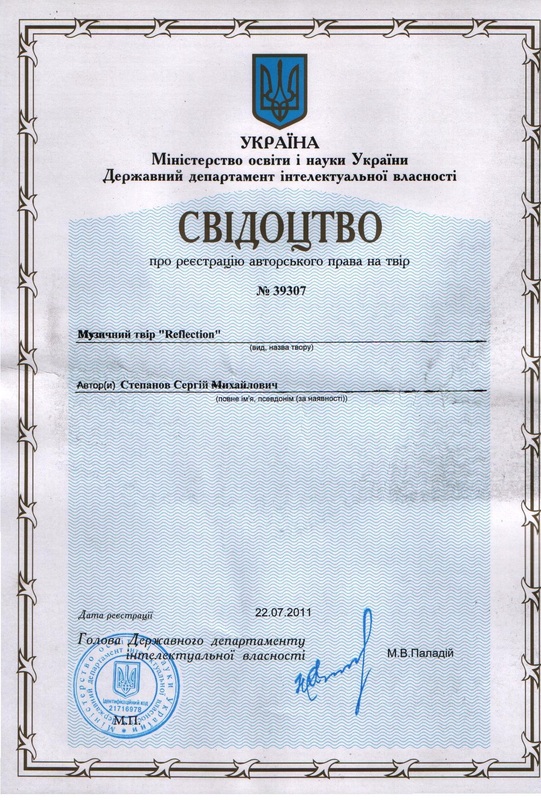 Elaboration of the digital teaching aids is performed by specialists on computer programming of the Institute of System Investigations in accordance with the Plan. Time period of elaboration of digital teaching aids is two years. * Title of the Project is “ Reflection “. * The scientific Project “ Reflection “ is dedicated to children. * Actuality of the Project is in innovation of digital technology into the system of education. * Task of the Project is to perform the neurophysiological tests on study of physiologic influence of number system teaching to a child’s psychoemotional status. 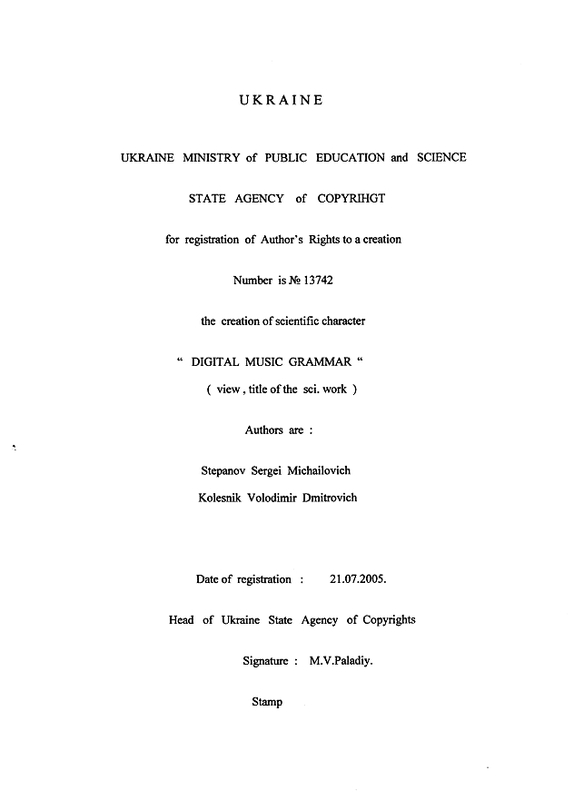 * Purpose of the Project is to put the methods “Digital Music Grammar “ and “ Algorithm of Microcycles “ into the practice of stage-by-stage music education for children both preschool age ( 5-7 years old ) and children early school age ( 7-9 years old ). 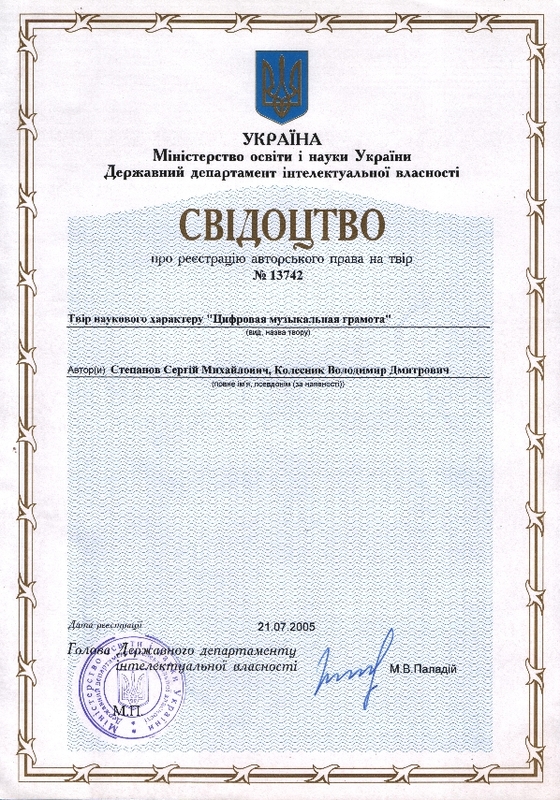 * It is expected from the realization of the Project to obtain the documentary confirmation on practical validity of the advanced technologies. * Application of the digital technology in the system of education will be useful for children who beding to study the music and also for schoolmasters who teach this subject. 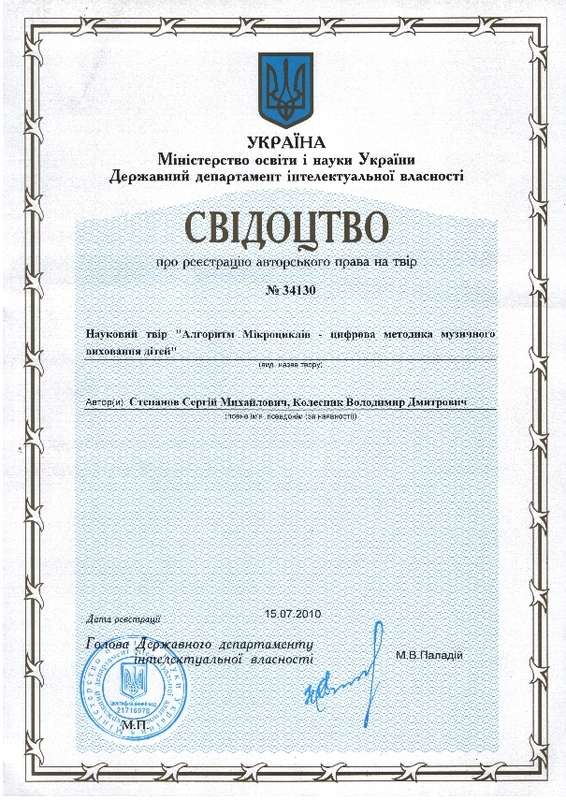 * The scientific material " Reflection " corroborated with document and certified by notary was forworded to Counceil International de la Musique ( France ) and ISME ( England ) for consideration . * Reviews on the scientific work were given by specialists on medicine in predominate importance, consequently, the neuro – physiological aspect of the sci. work is a key to the following step of investigations. * The sci. 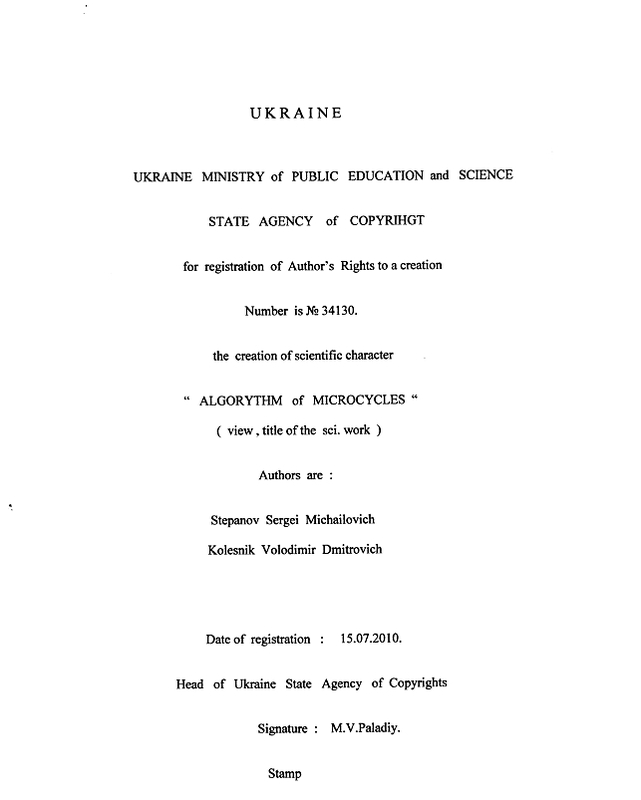 articles“ Digital Music Grammar “ and “ Algorithm of Microcycles “ are enclosed. * Authors of the sci. 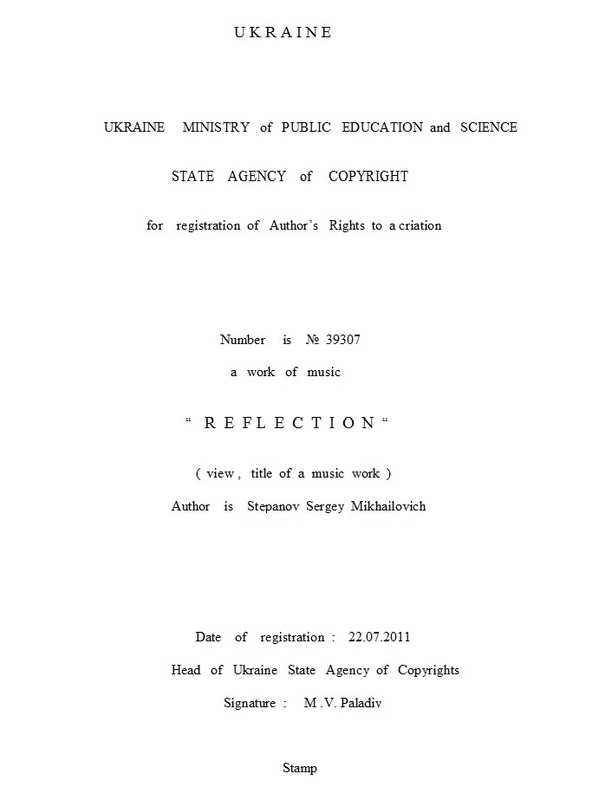 Project “ Reflection ” are : Stepanov S. M. Kolesnik V.D.